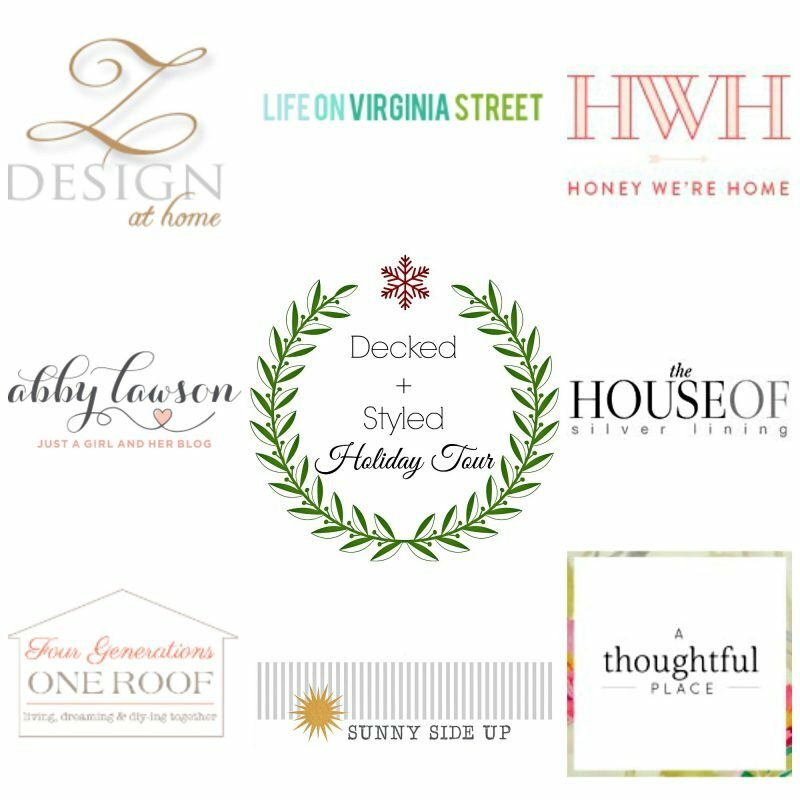 Welcome to the Decked & Styled Holiday Tour hosted by Bree from the very talented Z Design at Home. I am honored to be included in such an impressive group today and anxious to share our living room with you all. This is a room we spend time in every single night. 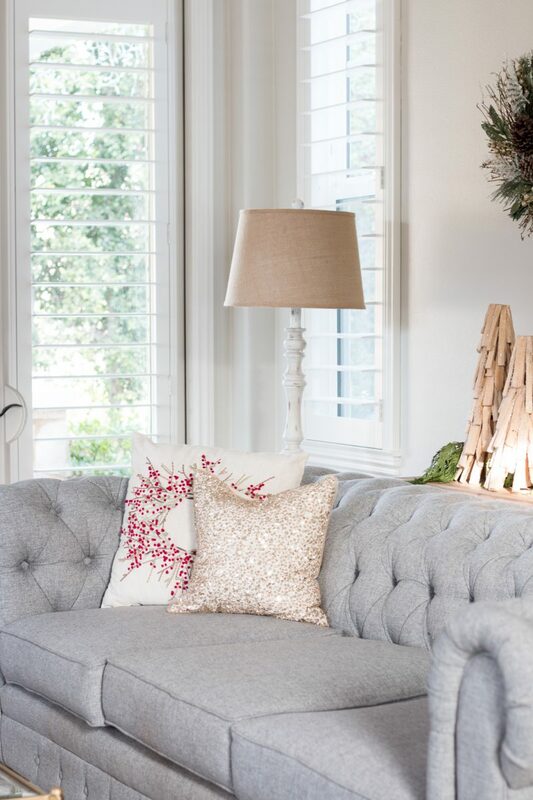 Whether it’s reading, chatting or blogging, this is my favorite spot to unwind and relax. 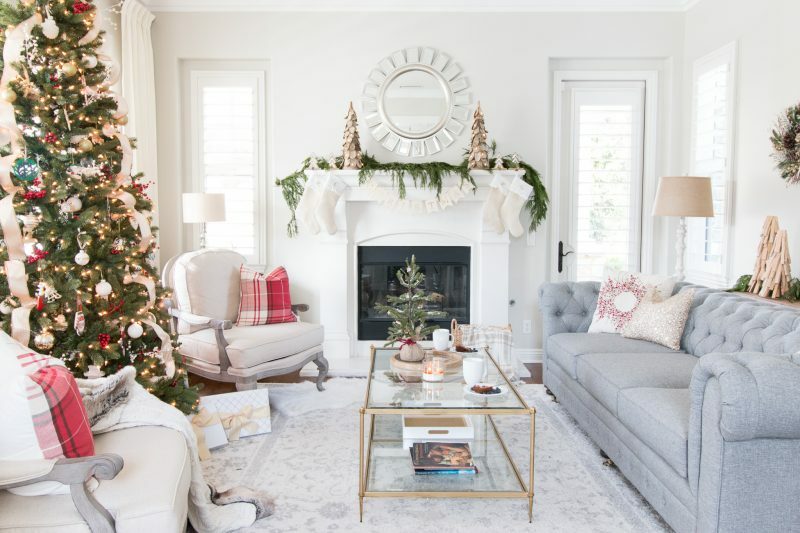 Here is our living room decked & styled for the holidays. This neutral rug has been one of our favorite purchases in this home. It’s very soft underfoot and a nice gray/white pattern that goes with everything. THE STOCKINGS ARE HUNG . . . 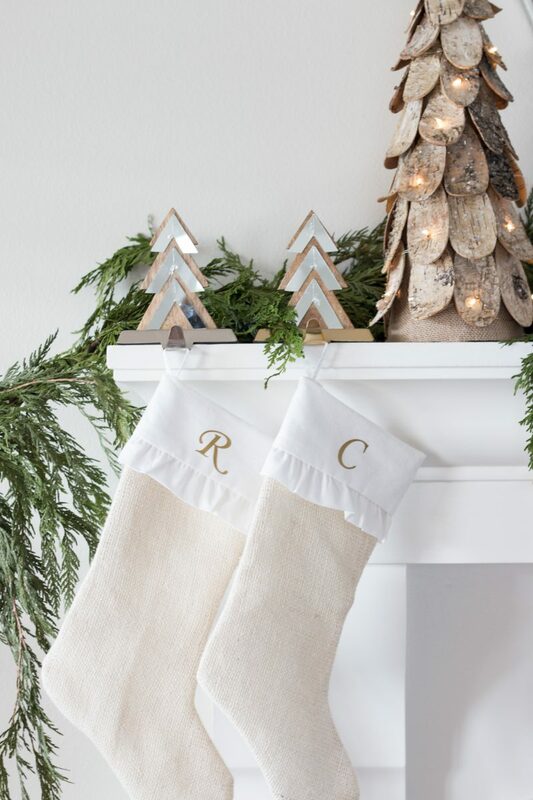 I found these stockings on Etsy and added the gold monogram to each one. The stocking holders were a lucky HomeGoods find. These light up trees were found at Michaels and add a nice glow to the mantel in the evening. The fresh garland is from Trader Joes. 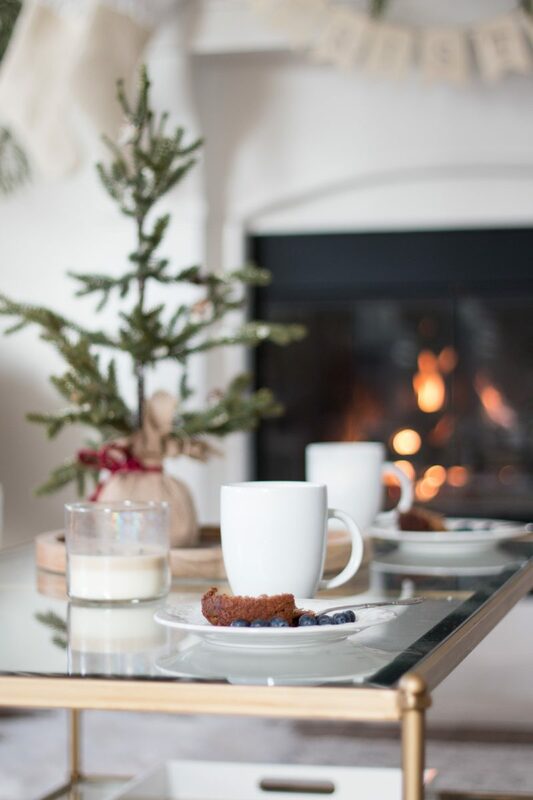 I have been very deliberate about spending time with friends this season and we are big on just setting aside an hour to catch up over coffee. It’s easier than going out at night and really starts the day off right. Especially during this hectic season when you can let the craziness take over. I love walking into our home and getting a peek of this room from the foyer. It receives a great amount of natural light. The walls are painted Pale Oak by Benjamin Moore. This wooden banner is a Michaels find. Only $6 and a nice natural addition to this room. I tried to keep things neutral and natural. 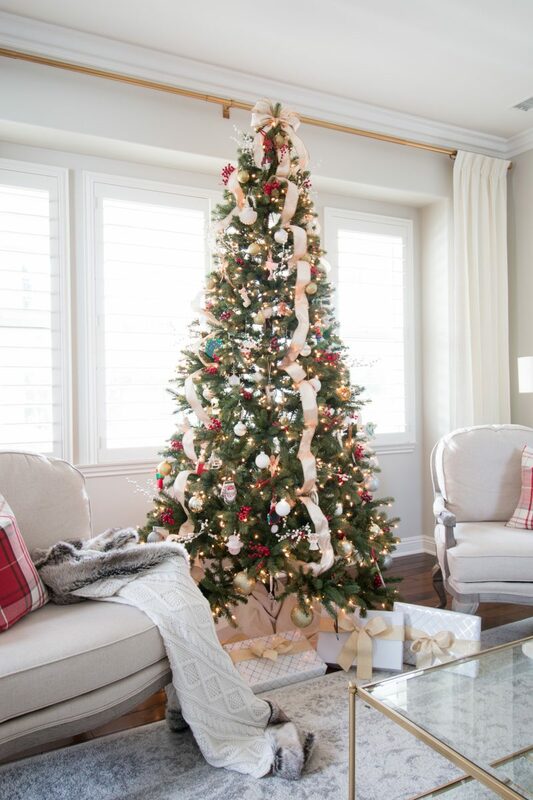 This is our family tree and it boasts all of our special ornaments from over the years. I add berries and ribbon and call it good. It’s important to us to have a tree that remains the same year to year. There is something about the tradition behind it that makes it that much more meaningful for us. We really do spend a crazy amount of time in here. 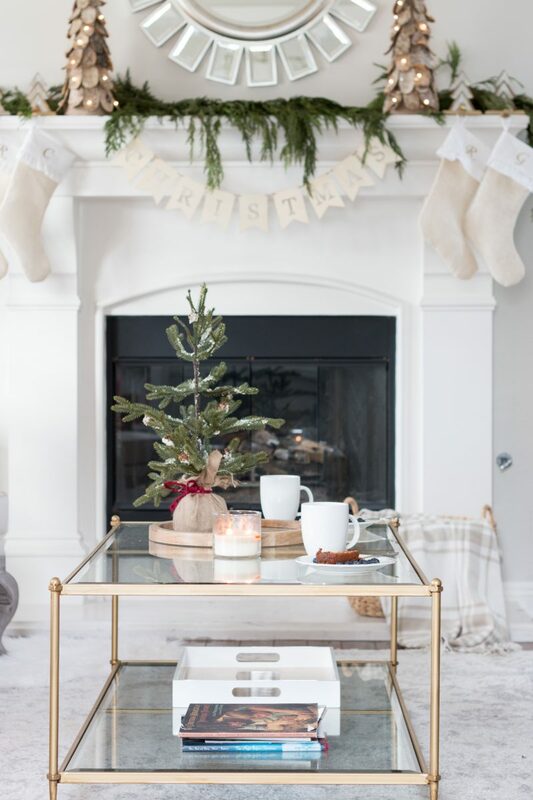 I start my day in here by the tree and end the day by the fire blogging. I think I am drawn to this room because it doesn’t have a TV which means it’s much more peaceful to me. Anyone else feel that way? One of my very favorite sights is seeing the sun shine in through the windows which light up the blessed family and our “O Holy Night” sign. The small wreaths on either side of the sign are from World Market (as is the table). Here’s an iPhone photo I snapped in the evening. I love being in here with the glow of the tree lights and fire. The living room is right off of our foyer. In case you missed it, you can see how I styled it here. 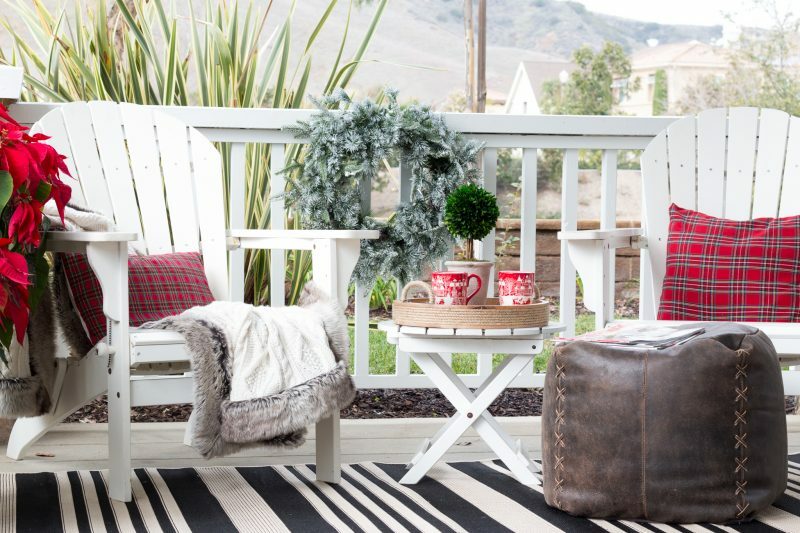 We spend a ton of time on our porch so it needed some Christmas love, too. Our holiday front porch can be seen here. Here is a peek into our dining room. I’ve kept it very neutral this year with fresh greens tied on the chairs. 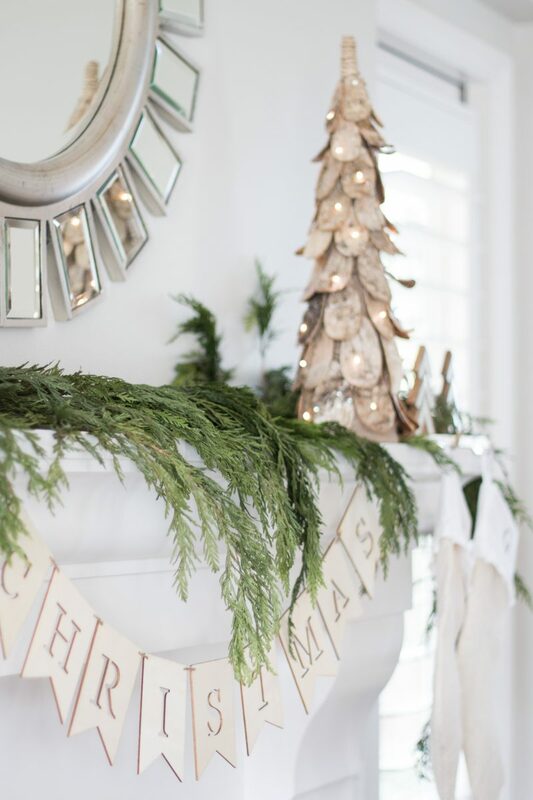 I created a short video to show you how we tied wreaths on our banisters this year. That can be viewed here. (It’s trickier than you might think to keep them from slipping). This year we recreated a tree that my parents always have. It’s our “Home Sweet Home” tree and the entire family helped make the gingerbread cookies and popcorn. And it’s safe to say that I am the world’s worst baker. It took me hours and hours to yield a few cookies. Then there’s the time my son ate icing off of our decorated cookies. Good times. At least we will remember this tree forever. You can see more of it here. You also know it’s a California Christmas when the little ones are still in shorts! 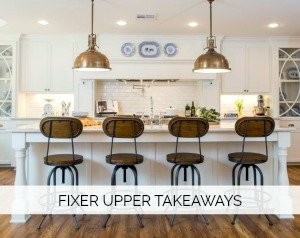 I’ll be sharing more of our kitchen tomorrow on the blog. Next up on the tour is the talented Jessica from Four Generations One Roof. She is an absolute doll and has a great eye for all things design. Just look at those doors! 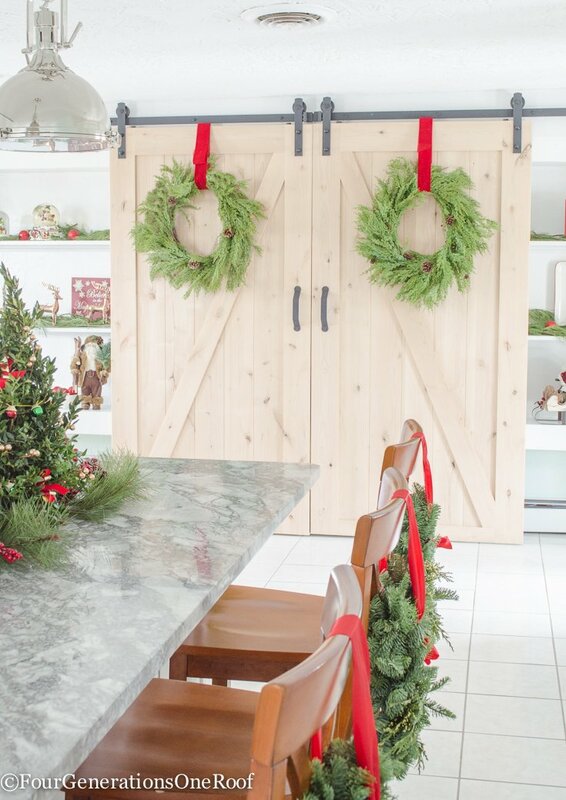 It’s a Christmas kitchen dream. Grab a refresh on your coffee and enjoy the tour. 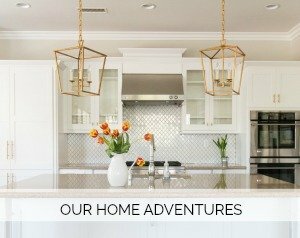 Your home is lovely as ever Courtney! 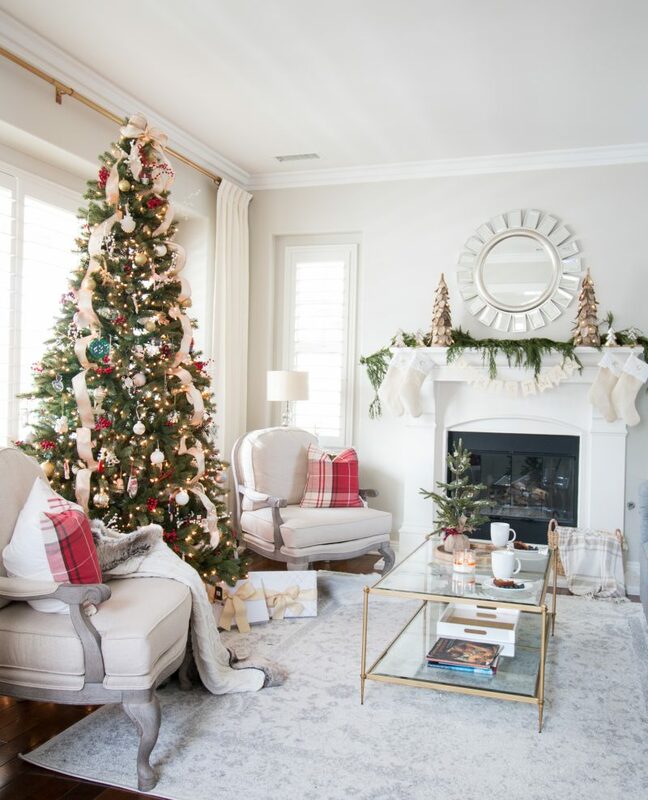 This will be a special time celebrating your first Christmas here! Courtney!! So you have to be the cutest thing ever in your outfit and styled entry way!!! AND the living room. OH MY! I absolutely love everything you did and the room looks and feels spectacular. Well done!!! 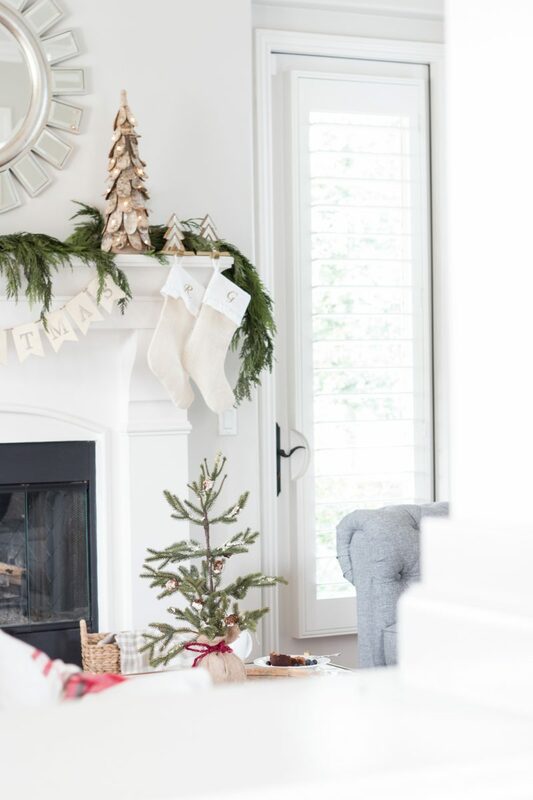 Love your decked and styled holiday look Courtney. It’s simply gorgeous! Your new house is so pretty and full of light. Happy Holidays! 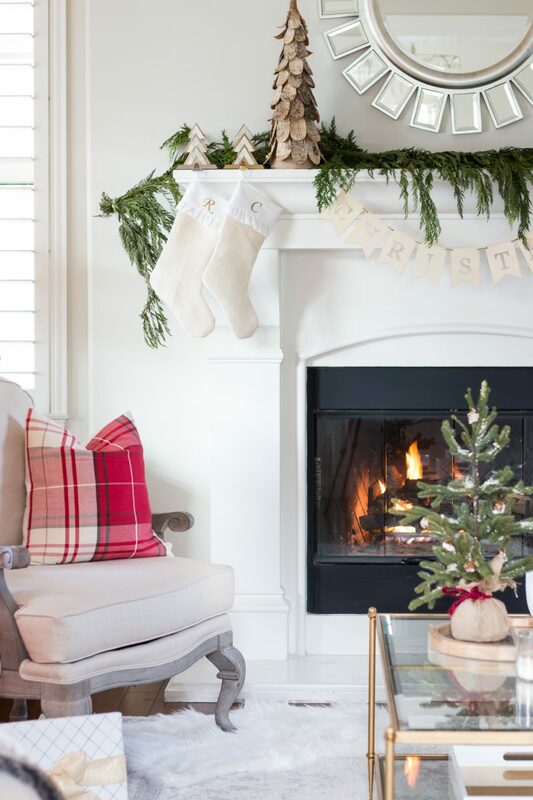 I love all of it, but I especially love that mantle! 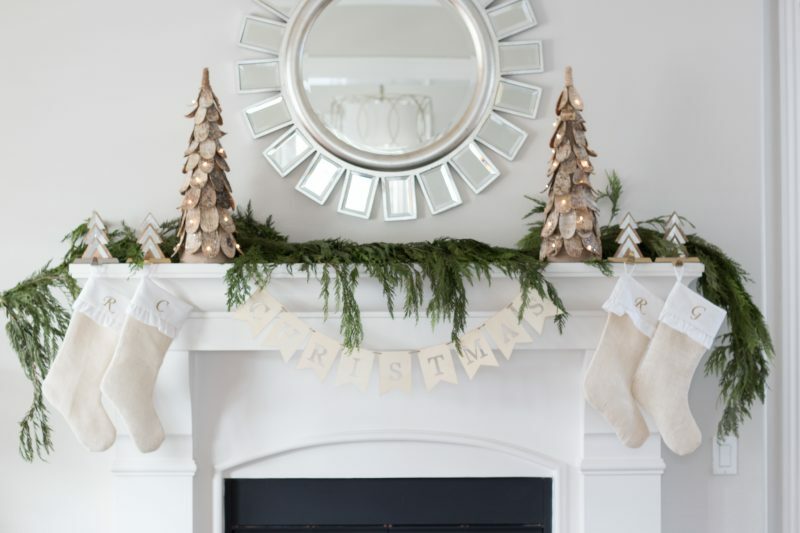 The greenery really pops with the neutral stockings and other decor. You did such a fabulous job and have such a beautiful home. Thank you for sharing! So beautiful! Absolutely love everything! The living room drapes are gorgeous! Did you make these too? Everything looks so beautiful Courtney. I love getting to see pictures of your new home…it’s so gorgeous!! Merry Christmas! Wow, that is one beautiful room! So many beautiful elements. 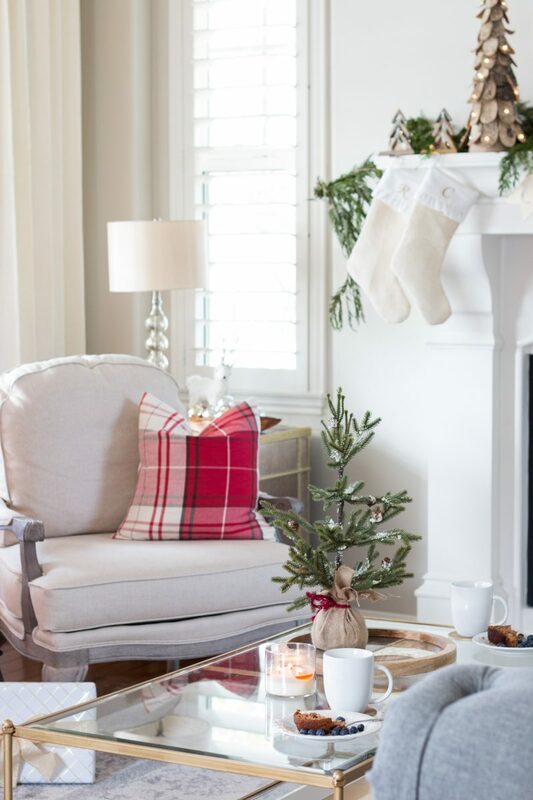 I think my fave is the sofa pillow with the wreath of red berries. Is it a recent find that we might be able to pick up? Or something you’ve had for a long time? Courtney, love your idea of hanging wreaths on the banister!!! 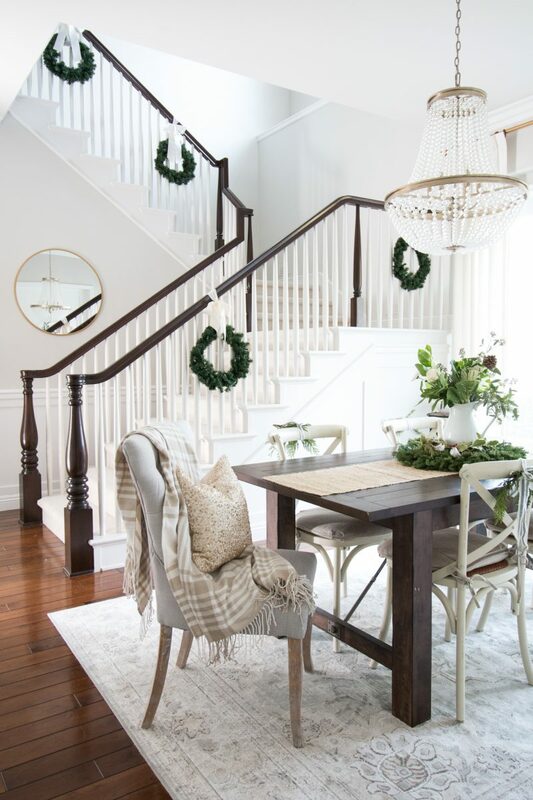 I am really tired of fighting my garland each year on my banister which is similar to yours, so am definitely considering the wreath hangings for next Christmas. 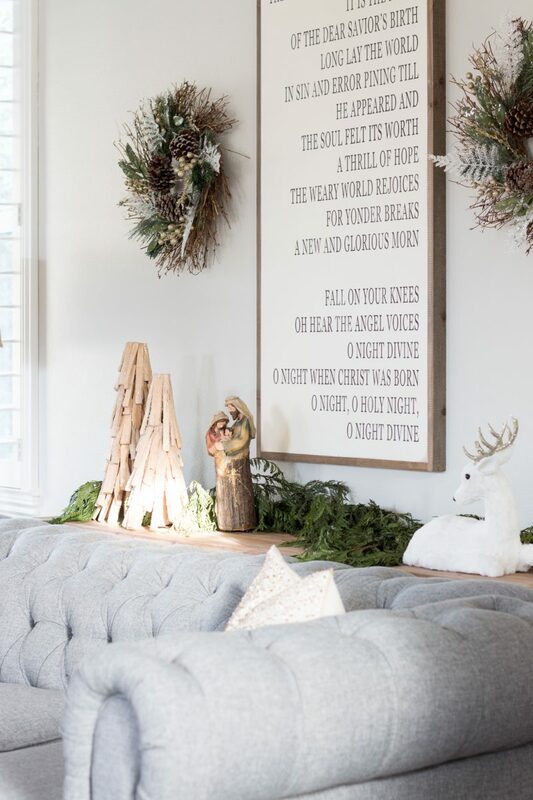 What size wreaths did you use? 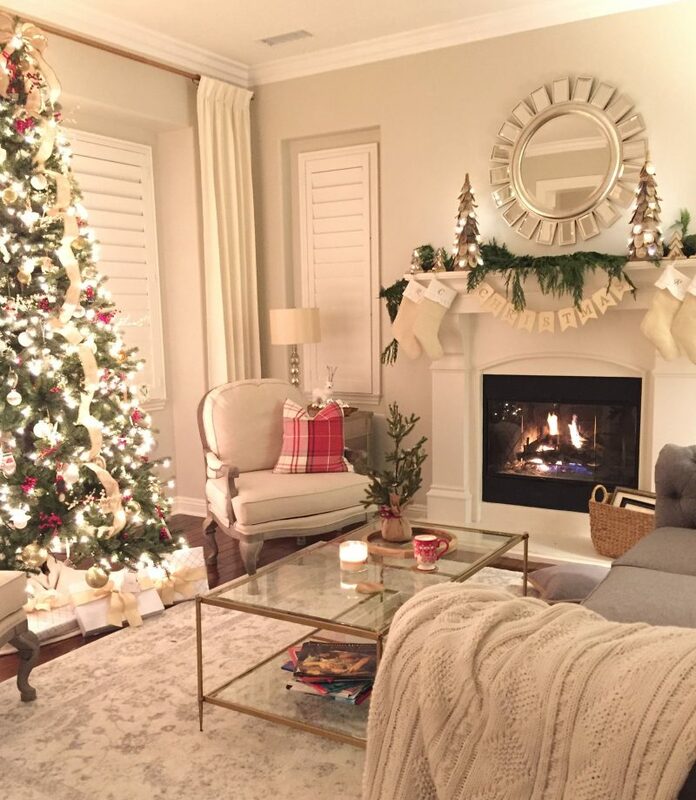 I love your gorgeous living room, Courtney! It is so cozy and inviting! And I love that you’re being so intentional about spending time with friends. It’s so important but tends to fall by the wayside when I get busy! Hope you have a wonderful weekend and a Merry Christmas! What a beautiful holiday tour! Merry Christmas! I love your home and sense of style, it is simply beautiful.